Patient engagement in an initiative that every hospital is thinking about and working on. Having patients play a more active role in their healthcare goes a long way to successfully preventing and managing chronic diseases. Engaged patients often equate to satisfied, compliant patients. While in concept, patient engagement seems straight forward, in practice it requires nurses, doctors and allied health professional to extensively build upon their communication and education skills. To provide truly patient centered care clinical must also adopt and perfect the art of shared decision making with their patients. Option Grid™ decision aids - Option Grid decision aids are brief, easy-to-read tools that help patients and providers compare healthcare options. The content is created based on the questions patients most frequently ask when they need to make preference-sensitive decisions. Providers can select two to three options to compare and, for select topics, fill in patient-specific data to customize the grid. Dynamic Health™ - Dynamic Health is an innovative evidence-based resource that helps nurses and allied health professionals master critical skills. With a prominent focus on patient training, Dynamic Health provides nurses and allied health professionals with the information they need to develop strong patient training and communication skills. Patient Education Reference Center™ - Patient Education Reference Center provides healthcare professionals with patient information handouts that can be customized, printed and given to a patient at the point of care. 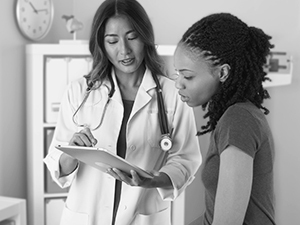 Patient Education Reference Center handouts are easy to read, evidence-based, include medical illustrations and are available in fifteen languages.